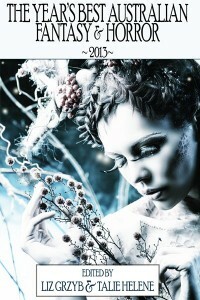 Ticonderoga Publications has released the Table of Contents for their latest volume of The Year’s Best Australian Fantasy and Horror 2013, which contains many excellent works of Oz speculative fiction. I’m fortunate that they’ve also picked up my tale “Flight”, which first appeared in Paula Guran’s Once Upon a Time: New Fairy Tales (Prime Books). Once again, an excellent cover. The book can be pre-ordered here. This entry was posted in fairy tales, News and tagged Angela Rega, angela slatter, Deborah Biancotti, Juliet Marillier, kaaron warren, Kirstyn McDermott, margo lanagan, Terry Dowling, The Year's Best Australian Fantasy and Horror 2013, Thoraiya Dyer. Bookmark the permalink.